I am a Research Associate in the Dyson School of Design Engineering, at the Faculty of Engineering at Imperial College London. My research interests lie in the areas of Mobile & Ubiquitous Computing, Mobile Sensing, Crowd Sensing and Human-Computer Interaction. 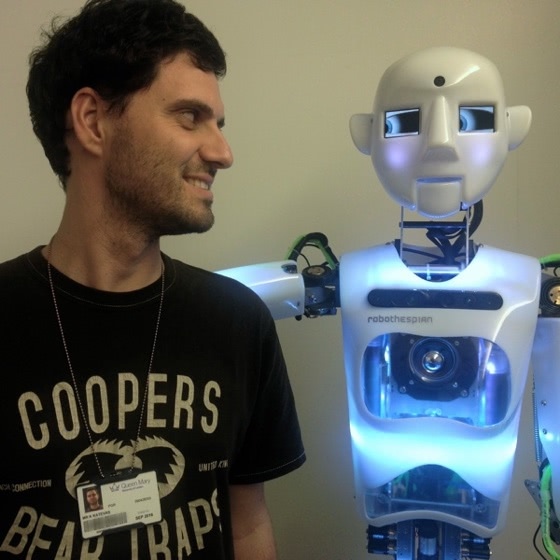 In the past, I have also been interested in robotics (Human-Robot Interaction). My Ph.D. research "Analysing crowd behaviours using mobile sensing" was conducted at Queen Mary University of London, under the supervision of Dr. Laurissa Tokarchuk and Dr. Hamed Haddadi. I am also the author of SensingKit, a fairly popular open-source mobile sensing framework for iOS and Android platforms. Our work "Typical Phone Use Habits: Intense Use Does Not Predict Negative Well-Being" will be presented at ACM MobileHCI 2018, Sept. 3-6 in Barcelona, Spain. Read more about this work at my blog post. Part of our latest work "Detecting Social Interactions using Multi-Modal Mobile Sensing" will be presented in this year's First UK Mobile, Wearable and Ubiquitous Systems Research Symposium, Sept. 12-13, 2018. Part of our latest work "Detecting Social Interactions using Multi-Modal Mobile Sensing" will be presented in this year's Next Generation Networking, Multi-Service Networks workshop (Coseners 2018), July 5-6, 2018. Our position paper "The Potential of Wearable Tech to Monitor Social Interactions through Interpersonal Synchrony Detection" has been accepted at WearSys 2018 workshop, taking place in conjunction with ACM MobiSys 2018. Full paper is in the works. Part of our work “Walking in Sync: Two is Company, Three’s a Crowd” has been demonstrated in this year’s Royal Institution Christmas Lectures at BBC Four. Read more about this work at my blog post. Our work "Beyond interruptibility: predicting opportune moments to engage mobile phone users" will be presented at UbiComp 2017, Sept 11-15 in Maui, Hawaii. Read more about it in Martin Pielot's blog post.